March 2019 marks the premiere of a work inspired by a William Billings round. 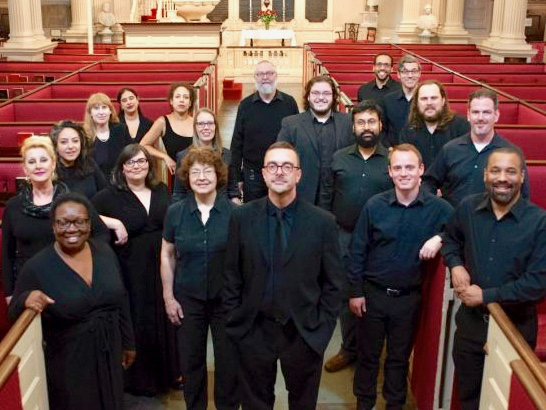 Under director Heinrich Christensen, the renowned choir of King's Chapel in Boston will sing the Mass on "When Jesus Wept" for SATB a cappella. It reflects and refracts phrases from this melody, building choral parts with both Renaissance and modern techniques. Please let me know if you are performing my music! It's fun to be in touch and what's more, good records of performances help a composer to gain income and grants, at no additional cost to the performer. The automated calendar begins with 2019; known earlier performances are listed below it. December 19, 2018 — 12:00 noon — Washington, D.C.
December 24, 2016 — 11:00 pm — Washington, D.C.
December 18, 2016 — 10:00 am — Washington, D.C.
December 7, 2016 — 12:30 pm — Washington, D.C.
October 2, 2016 — 10:00 am — Washington, D.C.
May 1, 2016 — 10:00 am — Washington, D.C.
Catholic Campus Ministries Chapel, 10 Harrison Ave.
Concert tour by Musikanten, Kerry Krebill, director, includes "Dona Nobis Pacem"
Concert at Latvian Society White Hall, C.J. Hoh singing with "Musikanten"
Concert at Jaani Church, C.J. Hoh singing with "Musikanten"
Vox Moderne and The Millennium Orchestra, Robert Ian Winstin, conductor, record "Sanctus & Benedictus" for choir & strings for ERM Media CD "Masterworks of the New Era"
The Prague Radio Symphony & Chorus, Robert Ian Winstin, conductor, records "You Are God" for ERM Media CD "Masterworks of the New Era"
Vox Moderne, Robert Ian Winstin, conductor, records "Snow-Flakes" (Longfellow text) for chorus & celesta for ERM Media CD "Made in the Americas"
Lots of projects, Facebook postings and other updates in the last 12 months, but I'm only now writing a new website article. Here's a quick run-down. PARMA Records is recording seven pieces in March for release on two CD's. Their holiday compilation is due out in Fall 2016 and a collection with American poetry in 2017. These include "Come Now and Celebrate" for chorus & piano and revised editions of my Sandburg Poems, first published and recorded 20 years ago. Meanwhile, Composers Choir released the Undiscovered Choral Gems CD with "Ecumenical Meditation" in 2015 and I created several virtual albums available on CD Baby. "Come Away to the Skies," accepted recently by Project Encore, got several more performances and led to a new commission for an American folk hymn setting; stay tuned for details. The two love ballads I arranged for middle school chorus and piano are now available via J.W. Pepper's My Score, joined by more pieces every month. Christmas Eve saw the premiere of my arrangement of the lovely "Mary's Soliloquy" by Lucy Vessey, arranged for solo mezzo and choir. Canada and Kansas recently saw their first performances of my music. My new SATB a cappella setting of John 13, "A New Commandment," echoes my beloved "Peace Be With You" and both will soon be available in printed octavos at My Score. Finally, I have edited several older pieces, including Philippe de Monte's Missa Inclina Cor Meum, which Musikanten just performed at First Night Alexandria and will take on tour to Germany and Poland. This and other HMM Editions (Sweelinck, Du Caurroy, H. Parker, A. Beach) are also being prepared for distribution by J.W. Pepper. And I promise to post more updates in the future!